We are pleased to announce a new “Life of the clinical trial” product that extends clinical trials coverage through our customized products-completed operations policy form for the duration of each protocol period. This innovative approach will enable clinical trial policyholders to seamlessly obtain coverage for the complete protocol period, instead of through sequential 12-month policies. Our tailored protection and services target clinical trials throughout North America, with the ability (or option) to offerworldwide coverage for suits and occurrences in the United States or Canada. This product is exclusively available through our affiliation with R-T Specialty, LLC. To learn more about this opportunity, please contact your local RT Specialty life science broker or email RT Specialty at lifescience@rtspecialty.com. A conversation with our insureds often begins with them asking, “Am I covered if…?” As an insurance carrier Risk Manager, I’m happy that they’re asking (and I’m really happy if it turns out they are asking before starting the business, practice, procedure or service that prompts the question). The question gives us all an opportunity to refocus on applying the risk management process to identify, analyze, treat and then re-evaluate the risk. Increasingly, these types of questions among healthcare providers are related to some kind of telemedicine service or activity, and they are interesting questions. The applications for telemedicine are growing exponentially (as is the variety of providers), much as TV and microwaves caught fire decades ago (figuratively, not literally, although hazards are also a domain of risk management). Why the surge in interest? If you’re attending the 4th Annual Cyber Liabilities Insurance ExecuSummit, consider attending the session titled “Cyber Liability Underwriting, Coverage Issues” that will be moderated by OneBeacon Technology President John Wurzler. This educational event targets cyber liability insurance professionals. The conference runs April 21-22 in Uncascville, CT. For event details, visit the conference website. OneBeacon policyholders may contact the Illinois Department of Insurance to file a complaint regarding any disaster-related dispute or issue at 1-866-445-5364 or online at http://insurance.illinois.gov/Home/ComplaintLinks.asp. From Government Risks to Technology, our groups are in the midst of an active spring conference season! Here’s a preview of where our businesses will share their specialty expertise this week. And if you’re attending any of the events mentioned below, we invite you to connect with us! On Tuesday, OneBeacon Design Professionals’ Bruce Demeter will moderate a panel on ethics at the American Institute of Contractors Annual Forum in Fort Worth, Texas. Government Risks’ Denver group will host a Colorado PRIMA meeting on Wednesday; while Joe Garcia will present at the Missouri/Kansas PRIMA Annual Conference in Lake Ozark, Missouri on Friday. Our Technology group will be in Madrid, Spain for the European Alliance of Insurance Companies (Eurapco) conference on Thursday and Friday. And finally, Keith Fruechte & Lisa Phillips of Financial Services (OBFS) will exhibit Wednesday and Thursday at the Texas Bankers Association (TBA) Annual Convention in Austin, Texas. 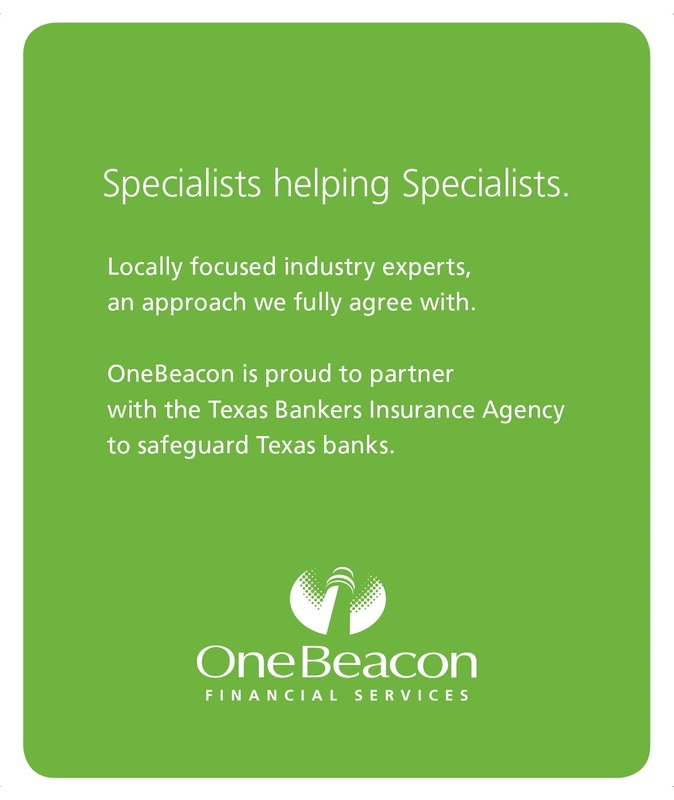 Visit our team at the Texas Bankers Insurance Agency booth #424. Pictured below, the OBFS graphic featured in the TBA program book! OneBeacon Healthcare’s Patty Hughes, Senior Vice President of Risk Management will participate as a panelist in the Crittenden Medical Insurance Conference on Monday, April 13. The session will take place from 2:30 – 3:30 p.m. ET at the Mandarin Oriental hotel in Miami, Fla. For more information on the conference, please visit the event website.